I am delighted to announce that The History Press are publishing my biography of Henry VIII's fifth wife in April 2019, with the title "Katherine Howard: Henry VIII's Slandered Queen". It presents my years of research into Katherine's brief life and offers additional content to my 2014 biography. You can preorder the book here. 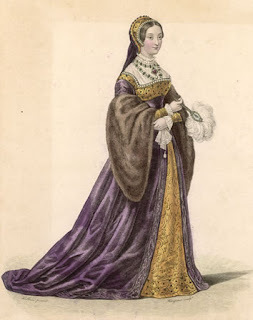 Every piece of surviving evidence we have indicates that, contrary to traditional perceptions, Katherine was a conscientious queen who fulfilled her ceremonial duties aptly. I argue in my book that Katherine’s style of queenship may have been directly shaped by Henry VIII’s changing expectations about the queen’s role. Too often it is assumed that she was uninterested in fulfilling her royal duties, but it is barely ever considered that perhaps her husband had a direct say in the way that Katherine responded to her role. Had Katherine given birth to a male heir and had the king never discovered her pre-marital past, then I do believe she would have been regarded as a very successful queen consort.